We’re saddened to hear that James “T-Model” Ford has passed away. He was 94. Born James Lewis Carter Ford in Forest, Mississippi. 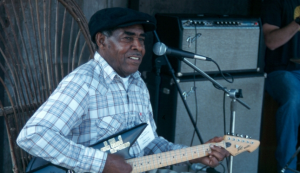 T-Model was a hard hitting and raw sounding Delta bluesman. While he played music for most his life, it wasn’t until the mid-1990’s the he played outside of Mississippi and released his debut on Fat Possum records in 1997, Pee-Wee Get My Gun. Go here for his discography. Below, check out a couple videos of Ford.